Isn't this just so sweet. 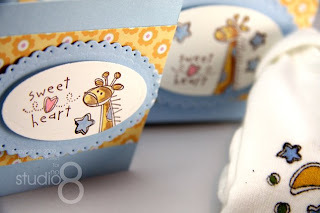 I just love the details, the Small White Gable Boxes the little tag that is pined to the onesie. I often like to give a little gift to co-workers who are expecting, just a little keepsake nothing to big. I thought instead of buying something I'll make something which to me is even more special. I'm all about going the extra mile. So I came up with this little gift set that could be applied to any stamp-set you like. 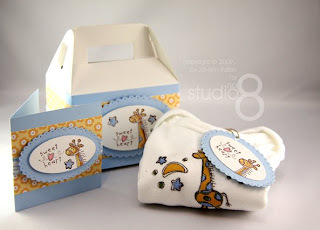 I just love the "Bundle of Joy" Stamp set though it is retired it is the one I always turn to when I design my Diaper Cakes and now for my gift sets. If you don't want to buy the little gable boxes then make your own box or even better that little envelope that everyone was disappointed in because of the size makes a fantastic gift box. Beautiful & sweet gift set ! How sweet! What an excellent idea! I love visiting your site to see all the new and beautiful projects you come up with. You are very talented. Oh my!!! This is sooooo cute!!! I love it!! Awesome idea!! This is amazing and such a good idea. Sorry if I have missed this question elsewhere on your site but how do you get the colours not to run on the outfit?